Following the ceremony, the newly weds customarily spend a few minutes in a private room for yichud, which means “togetherness.” There, they will quietly share the excitement of their first moments together as husband and wife. 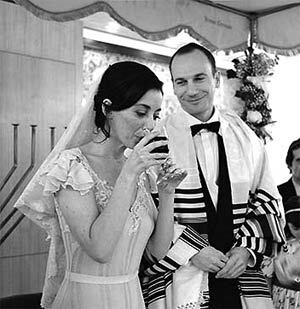 Since the wedding day is often a whirlwind, these private moments of yichud often are the only private moments the bride and groom will share for the entire day. This time is really special, and they then emerge from yichud as a couple to greet their guests. 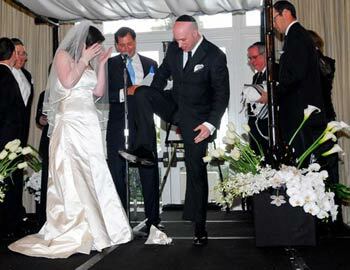 According to Jewish law, the wedding guests are commanded to celebrate, to have fun, and to increase the joy of the bride and groom on their wedding day. So, dancing, singing, and rejoicing throughout the night is very much encouraged! I am looking for a lawyer to file a class action suit against Shel Silverstein and Johnny Cash! Because of their song, ‘A Boy Named Sue,’ many parents throughout America have given their children ridiculous names in hopes of filling some sort of nominal vacuum in their lives or perhaps in the spirit of Darwinian humor. How many innocent children have suffered because of these lyrics? My father is one of those parents who decided, when he was just ten years old, that his son would nto have a humdrum name like Howard (his name), but rather something outrageous that people would remember. He predicted that a name like ‘Spike’ might allow entrée into pick-up basketball games even if it meant that no mother would ever allow his future son to date her daughter…but that was a sacrifice that my Dad was willing to make. In fact, my father was so attached to the idea that he decided that I was going to be ‘Spike’ no matter if I were a boy or a girl! When my younger sister was born, he toyed with ‘Nail’ or ‘Hammer’ but by then my mother had thankfully seized control of the baby naming apparatus. As for me, no matter how hard my father pleaded, my mother would not actually name me ‘Spike’ (because she is ‘normal’), and so my given name is ‘Nicholas’, although the only people who call me ‘Nicholas’ are the bill collectors. The oldest of three kids, I grew up in Boston at Temple Israel. As a teenager, I went to a Quaker boarding school and then to Bucknell University in Pennsylvania where I majored in American History with a focus on secondary education. In 1993, I spent a semester abroad at Hebrew University of Jerusalem in an experience that forever changed my life and awakened my passion for Judaism. After college, I moved to New York City to work for a recruiting firm that focused on technology professionals for Wall Street, and then moved out to San Francisco where I founded my own company which aided the venture capitalists to build their pre-IPO ‘start-ups’ from scratch. 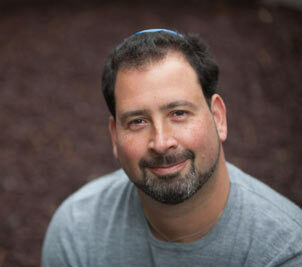 This was an exciting time, but in 1999 I decided that rather than continue with business, which I absolutely loved, I would rather chase my latent dream of becoming a rabbi. Since deciding to pursue the rabbinate, I have had the good luck to travel the world, to spend a year in Jerusalem, to learn the wisdom of our scripture, and most importantly, to marry my wife, Marita, with whom I look forward to raising a beautiful family. Four months ago, we had our first child, a wonderful baby boy. Now, what to name him? Forever scarred by my father’s decision, I had decided when I was just ten years old that my future son would neither have a humdrum name like Howard nor a hyper-macho name like Spike. I wanted a name that would allow my son entry into pick-up basketball games and reassure mothers that my son should date their daughter. Marita and I picked “Maccabee”…as in, “Big Mac is on my team!” and “would Maccabee like to stay for dinner?” In any case, Marita, Maccabee, and I look forward to joining your family at Temple Israel.